Tarbosaurus skeletal mount at the Mesa Southwest Museum. Photo © Geb Bennett. The theropod (meaning "beast-footed") dinosaurs are a diverse group of bipedal saurischian dinosaurs. They include the largest terrestrial carnivores ever to have made the earth tremble. What most people think of as theropods (e.g., T. rex, Deinonychus) are extinct today, but recent studies have conclusively shown that birds are actually the descendants of small nonflying theropods. Thus when people say that dinosaurs are extinct, they are technically not correct. Still it's not as exciting seeing a sparrow at your birdfeeder as it would be to see a Tyrannosaurus rex there. Our knowledge of the evolutionary history of the Theropoda is constantly under revision stimulated by new, exciting fossil finds every year or so such as Mononykus olecranus, a very bird-like theropod found recently in the Mongolian desert, or Giganotosaurus carolinii, a giant theropod probably rivaling the size of T.rex., found recently in Argentina. In fact, the 1960's discovery and study of the remains of Deinonychus antirrhopus helped to revise paleontology's old vision of all dinosaurs as slow, stupid reptiles, and was a key factor in the onset of the controversial hot-blooded/cold-blooded debate. Currently, there are two or three main groups of theropods, depending on whom you ask; we have yet to fully understand their origin. Why is this so? The main reason is the lack of good specimens; theropod remains are fairly rare and more often than not, fragmentary  theropods have a poor fossil record compared to most of the ornithischian dinosaurs. Fossils of small theropods are especially rare, since small bones are harder to find and are weathered away easily. Without well-preserved, complete specimens, it is hard to tell who is most closely related to whom using cladistics. 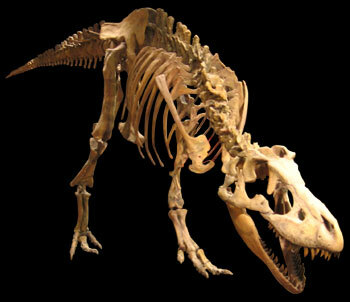 Several characters that typify a theropod: hollow, thin-walled bones are diagnostic of theropod dinosaurs. A jumbled box containing theropod bones (from the UCMP collections) is shown at right. The hollow nature of the bones is certainly more obvious in 3D, but you should at least be able to make out the general tubular structure of the bones. Other theropod characters include modifications of the hands and feet: three main fingers on the manus (hand); the fourth and fifth digits are reduced; and three main (weight-bearing) toes on the pes (foot); the first and fifth digits are reduced. Most theropods had sharp, recurved teeth useful for eating flesh, and claws were present on the ends of all of the fingers and toes. Note that some of these characters are lost or changed later in theropod evolution, depending on the group in question. The Herrerasauridae are an early group represented by Herrerasaurus, which was discovered in a wonderful middle-late Triassic period fossil locality (the famous Ischigualasto Formation) in Argentina in the 1970s. Another herrerasaur is Staurikosaurus, which has been known since the 1960s from remains found in Brazil. More recently (in 1993), another herrerasaur-like fossil was found in the same general area and named Eoraptor, or "dawn thief." It appears to be closely related to the herrerasaurs, but smaller in size and slightly older. 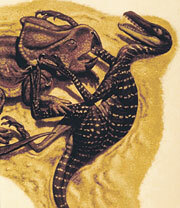 Both Eoraptor and the herrerasaurs seem to have been small to medium-sized carnivores. These curious animals have some basic theropod characteristics, but lack others; in fact, they lack some dinosaurian characteristics as well. The Herrerasauridae and Eoraptor may be the earliest group of theropods, or it is quite possible that they are not even theropods at all, but rather non-dinosaurs (dinosauromorphs) closely related to the ancestor of dinosaurs. The fact is, we don't know for sure. Experts in dinosaur systematics are currently embroiled in a controversy over the exact relationships of the Herrerasauridae to theropods and other dinosaurs. The last, and by far the largest group of theropods is the Tetanurae, consisting of two major clades (sister taxa), the Carnosauria and the Coelurosauria. Some early tetanurines such as Megalosaurus fall outside of this dichotomy, but most are poorly known. The carnosaurs were the huge, fierce predators such as Allosaurus (shown at the top of this page chasing Dryosaurus, an ornithischian dinosaur), and recent headline-makers like the gigantic Carcharodontosaurus and Giganotosaurus, both of which seemed to have reached or exceeded the size of T. rex, making them the largest terrestrial bipeds ever to have terrorized the terrestrial realm. The Coelurosauria were generally smaller in stature, but more diverse, including such famous creatures as Velociraptor (shown at right grasping Protoceratops, a ceratopsian dinosaur) and our feathered friends the birds. Recent studies have agreed that T. rex and the tyrannosaurs belong with the coelurosaurs, not with the carnosaurs as was originally believed. Such is the ever-changing nature of theropod phylogeny; new finds and analyses are frequently overturning old ideas. This area of dinosaur paleontology is in a major state of flux. Enjoy your visit with the fearsome and amazing theropods! You can learn more about theropod groups by either selecting links from the above text, or by clicking on a box in the cladogram pictured above. Take an "audio tour" and hear about the discovery and reconstruction of Dilophosaurus from the discoverer himself, the late Sam Welles.